Anaesthesia is a relatively recent scientific invention. However the need to perform various surgical procedures has existed for thousands of years. The archaeological record contains evidence of the Egyptians making openings in the skull on what appears to have been living individuals. Surgical need arose in situations where there were fractures of bones and abscesses. In 1540, Paracelsus, a Swiss physician experimented with what appears to have been a formulation of ether mixed in chicken feed. It was described as causing the chickens to fall asleep and later waken without having suffered any harm. It also appears that the Inca’s in South America may have used the chewed coca leaf mixed with saliva to create a form of local anaesthesia when performing surgical procedures. The work of great scientists such as Harvey, Hooke, Boyle and Priestley gradually lead to an understanding that blood flowed through the lungs and mixed with atmospheric gases, oxygen in particular, to sustain life. It was later in the 18th century when chemists such as Humphrey Davy isolated and then experimented with nitrous oxide (laughing gas) that the first forms of surgical anaesthesia were experienced. In the 1830’s ether was used to excise a lesion on someone’s neck although these results were kept secret and only published in 1848. In the 1844 that public demonstrations of the use of nitrous oxide for dental extractions were conducted. Some of these were successful however with the primitive equipment and limited understanding as to how to use the drug, there were also failures and this dampened the enthusiasm for the practice. However the need and desire of surgeons and dentists to be able to perform painless procedures, forced them to continue experimenting. By 1846 the technique had advanced to the degree where a successful public demonstration of the correction of a venous malformation in a patients neck was conducted and this is credited as being the first such event. In 1847, obstetricians started using ether and later chloroform to relieve the pain of childbirth. There was opposition to this as some individuals believed that women should experience the pain of labour. However John Snow (also discovered cholera) administered chloroform anaesthesia to Queen Victoria during labour and this played an important role in promoting the societal acceptance of obstetric anaesthesia. Anaesthesia is credited with allowing surgery to develop although initially this change took a few decades to take hold. It required the development of hospitals and overcoming the problems with infection before surgery could be improved. The collaboration of Sigmund Freud and Karl Koller is credited with the discovery of local anaesthesia. They observed the numbing effect on the tongue of the experimental drug, coca. After experimenting on a frog, they instilled the solution into their own eyes and noticed how they were able to touch the cornea and conjunctiva of their eyes without any sensation. It took the further work of James Corning to experiment with injecting cocaine around the spinal cord to discover the local anaesthetic property of this agent when applied to nerves. With the development of more pharmacologically friendly agents, namely procaine, local and regional anaesthesia could be extended with the development of many of the nerve blocks that are still in use today. It was not until the 20th century with the discovery of the group of drugs, barbiturates, that intravenous anaesthesia could develop. These agents were useful due to their short duration of action and they could be used to induce anaesthesia by intravenous injection. In the 1940’s and 50’s further anaesthetic drugs were introduced that allowed for an extension of the practice of anaesthesia. These drugs included the muscle relaxant curare and the inhalational agent, halothane. 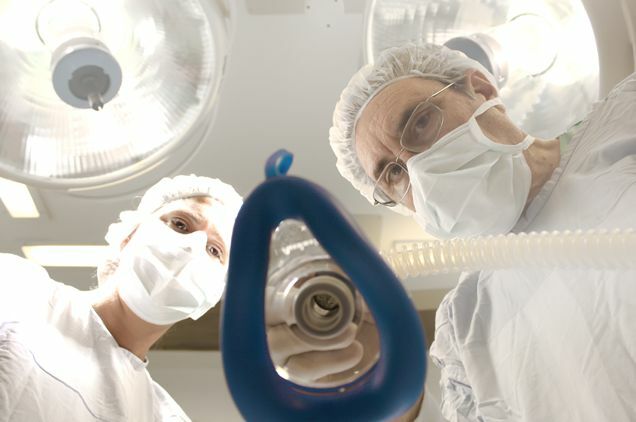 It became possible to begin an anaesthetic with the injection of a barbiturate, maintain the anaesthetic with the use of halothane being delivered into the lungs through breathing or artificial ventilation and if necessary, paralyse the patient with curare. This combination allowed for improved surgical conditions that allowed surgeons to perform ever increasingly complex surgical procedures. The development of a new discipline is never easy and the early decades of anaesthetic practice were fraught with danger. For example it was not understood that if a patient has eaten a meal they are at increased risk of vomiting/regurgitating under anaesthetic and this can cause obstruction of the trachea with respiratory failure and death. In fact patients were told to eat a meal before an anaesthetic as this was thought to protect them from the risk of vomiting. The drugs used in anaesthesia are extremely powerful and when they were first introduced this was not fully understood and they were administered in excessive doses often resulting in severe complications and death. The application of science to the practice allowed for the rapid improvement of the safety of anaesthesia as the discipline was subjected to scrutiny and further technological advances were made. Today the practice of anaesthesia is extremely safe as a result of certain key areas of practice that include appropriate training of anaesthetists, understanding patient physiology, understanding the drugs that are used and the application of modern monitoring equipment. In the early days anaesthesia was administered either by physicians or surgeons. It was common practice to have the surgeon perform both the anaesthetic and the surgery. This is clearly a dangerous practice as one person cannot pay appropriate attention to these two completely different components of patient care at the same time. The development of the discipline varied in different countries but by the mid 20th century, it had become established that anaesthesia should be performed by medical doctors who have undertaken further training in the discipline of anaesthetics. As the discipline grew in complexity the training increased in length to the point where it is now the same duration and standard as applies to all other specialist qulifications. In Australia, the training of specialist anaesthetists is governed by the Australian and New Zealand College of Anaesthetists (ANZCA. http://www.anzca.edu.au). After completing training as a medical doctor, individuals may them commence training as an anaesthetist. Initially this will include work in medical areas other than anaesthesia and then after application to join the training scheme, training in anaesthesia may commence. The training is 5 years in duration and includes writing 2 exams and completing a research project. Details of the training may be found on the ANZCA website listed above. For certain subspecialities such as cardiac or paediatric anaesthesia, a further 2 to 3 years of experience and training is required to become proficient in these areas. In total it will take a minimum of 14 – 15 years from when first starts studying to be a doctor to become a specialist anaesthetist. After qualification it is necessary to maintain ones level of training by participating in the Continuing Professional Development Program that is administered by the College of Anaesthetists. This requires that a specialist engage in at least 50 hours of educational activities over the course of a year. These are the training standards and measures that have been put in place to ensure that anaesthetist are trained to a level that is appropriate with maintaining and protecting the standards required to ensure the maximum safety when administering anaesthesia to a patient.